These were [this was?] 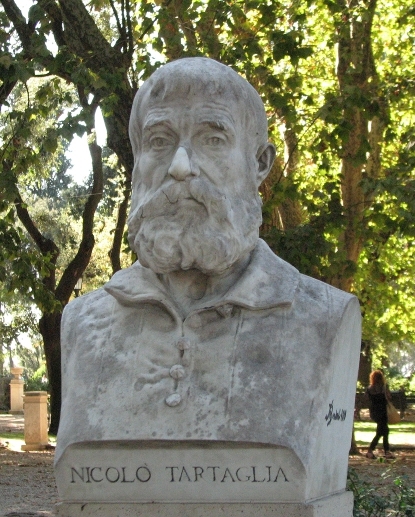 the first public park opened in the city, and around 1850 a bunch of busts of prominent Italians were commissioned for the park. 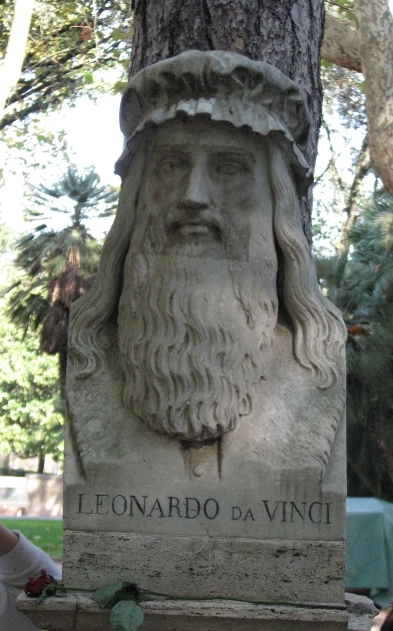 Some of these were kept in the park, some were moved and then moved again, and some were altered to represent Italians who seemed more worthy of being commemorated. Then through the 1950s more busts were added and there are now a total of 228, of which 225 are of men and 3 are of women. Bruno was a big fan of Copernicus’s still-unpopular view that the earth revolves around the sun, though he also thought that the sun was nothing unique either — just one of an infinite number of heavenly bodies. 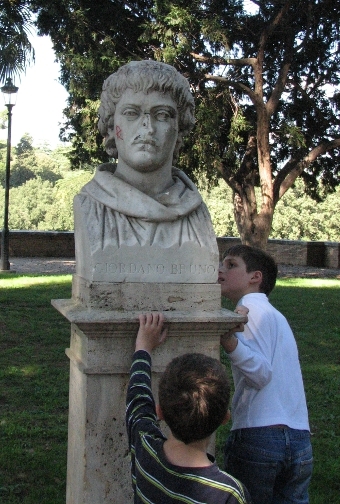 Poor Bruno didn’t get along too well with the church of the time, and was burned at the stake in 1600. Next up is Giuseppe Luigi Lagrangia, also known as Joseph-Louis Lagrange (though Wikipedia and Mactutor say his middle name was Lodovico originally). 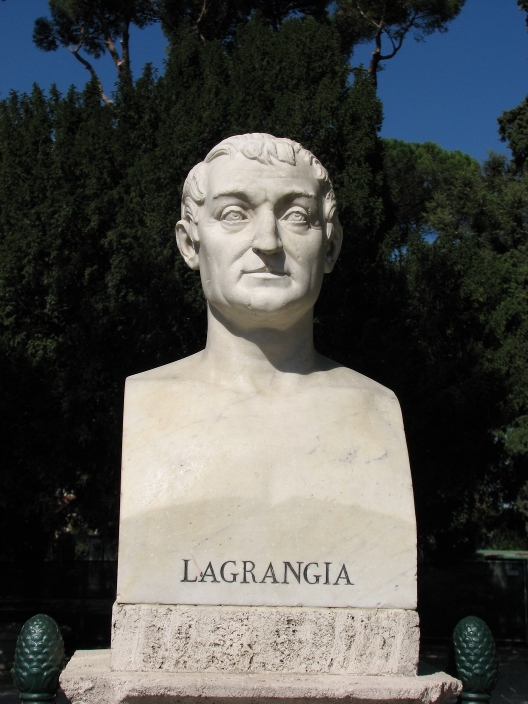 He looks totally proud of everything named after him, like the Lagrangian and Lagrange Multipliers. And finally, this is Niccolò Fontana, who became known as Tartaglia (stutterer) because the French invaded his hometown of Brescia when he was a teen and sliced his face. Ugh. 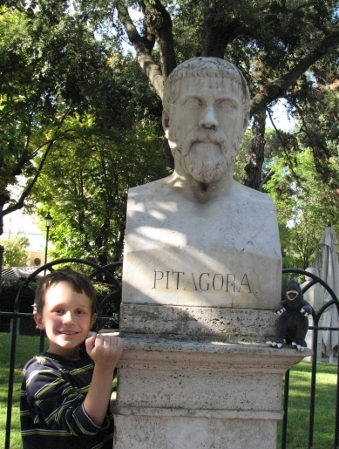 He translated Euclid into Italian and is also known for his role is finding a general solution to the cubic equation, which deserves a post all to itself someday. Émilie du Châtelet was born December 17, 1706, and died September 10, 1749. Her academic training came at home under the supervision of tutors and her parents. Voltaire commented that “her mind was nourished by reading good authors in more than one language…[and that] her dominant taste was for mathematics and philosophy”. Her Dissertation su la nature et la propagation du feu was submitted to the Academie des Sciences in Paris, for the Grand Prix of 1737. While her submission did not win (she lost out to Leonhard Euler), her work was still published by the Academie in 1744. In 1740, she published a book Institutions de physique, an attempt at a unified treatment of Cartesian, Newtonian, and Leibnizian philosophy. At the time of her death, she was working on her translation of, and commentaries on, Newton’s Philosophiae naturalis principia mathematica. Subsequent work on that translation was undertaken by Alexis Clairaut, and completed in 1759. The next French translation of Newton’s Principia, so far as I can determine, was published in 1985, which speaks to the influence and significance of Émilie du Châtelet’s contribution. By 1756, Bougainville had published two volumes on the integral calculus, explicitly presented as a supplement to and extension of L’Hopital’s Analyse des infiniment petits pour l’intelligence des lignes courbes (published in 1696, the first textbook on the differential calculus). Bougainville’s work earned significant praise, including Bougainville’s election to membership in the Royal Society of London. However, this publication also marked the end of Bougainville’s mathematical career. After joining the French Army in 1754, Bougainville served with some distinction in the French and Indian war. By the early 1760s, Bougainville had joined the French Navy. 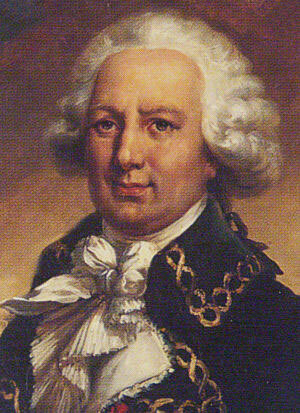 In 1764, he establishing the first European settlement on the Falkland Islands (Port St. Louis), and during 1766 – 1769, he became the 14th known Western navigator, and first Frenchman, to circumnavigate the globe. During that voyage, his ships came upon the heavy breakers of the Great Barrier Reef, and turned away to the north, toward the Solomon Islands. (Bougainville thus narrowly avoided sailing upon Australia, some three years before James Cook’s expedition which claimed New South Wales for Great Britain.) Bougainville Island (politically part of Paupa New Guinea) was apparently named by Bougainville during this voyage. The flowering vine bougainvillea is also named for Louis Antoine de Bougainville. A plant native to South America, Bougainville wrote extensively about it for European readers following his circumnavigatory voyage. Church’s most significant mathematical contribution was the creation (with Stephen Kleene) of the λ-calculus, a formal system in the language of functions. Church is probably best remembered for Church’s Thesis, the claim that every effectively computable function is in fact a function that is definable in his λ-calculus. Kurt Gödel balked at this claim, and introduced the primitive recursive functions as a more natural alternative to model the notion of effective computability. Stephen Kleene, a student of Church, showed that in fact the functions definable in the λ-calculus exactly correspond to Gödel’s primitive recursive functions. By the late 1930s, another notion of computability had been put forward by Alan Turing, and it too had been shown to be equivalent to λ-definability. The sets of λ-definable functions, primitive recursive functions, and functions implementable as Turing Machines, are identical sets of functions. 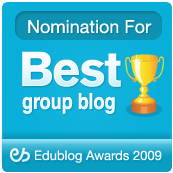 This agreement of three diverse approaches to formalizing the vague notion of “effectively computable” is viewed as strong evidence that all three approaches have in fact captured that concept. At its most general, Church’s Thesis is the claim that effective computability is equivalent to these three formalizations. Given that “effectively computable” is unlikely to ever be formally defined, Church’s Thesis remains an unproven (and unprovable) claim. Alas, Church’s Thesis first appeared in 1936, and was not a part of Church’s (doctoral) thesis of 1927 (Alternatives to Zermelo’s Assumption, an attempt to create a logic in which the axiom of choice is false). Union College has a large collection of these models, and has created a web page devoted to their collection and its history. One of their computer science students [now alumnus], Mike Pinch, created software to simulate the models, and give the user the opportunity to manipulate the models. Union also has posted several .avi videos of this software in action. Pierre-Joseph-Étienne Finck was born October 15, 1797, and died July 27, 1870. Finck’s most significant mathematical contribution appears to have been his analysis of the running time of the Euclidean Algorithm, which he published in 1841. One wonders if his own life experiences contributed to his interest in recursive algorithms. Upon graduating from the École Polytechnique in 1817, he was admitted to the Artillery School. However, he wasn’t satisfied with his studies there, and applied ( in March 1818 ) to transfer to the Royal Guard cavalry. Request denied. 4 months later, he applied to the cavalry again, this time saying that he would resign if his request was not honored. Request denied. So he resigned from Artillery School…. But by early 1819 he had second thoughts, and applied for reinstatement to the Artillery School. Request denied. At this point, he changed tactics, and began studying mathematics at the University of Strasbourg. He completed his doctoral dissertation (on movements of the terrestrial equator) in 1829. Ironically, by that time, he had been appointed as a mathematics instructor at the Artillery School of Strasbourg. I suppose Finck’s life might provide a valuable lesson in the importance of sticking to your guns. Georg Pick was born on August 10, 1859, and died on July 26, 1942, having spent much of his career as a professor at the German University of Prague. 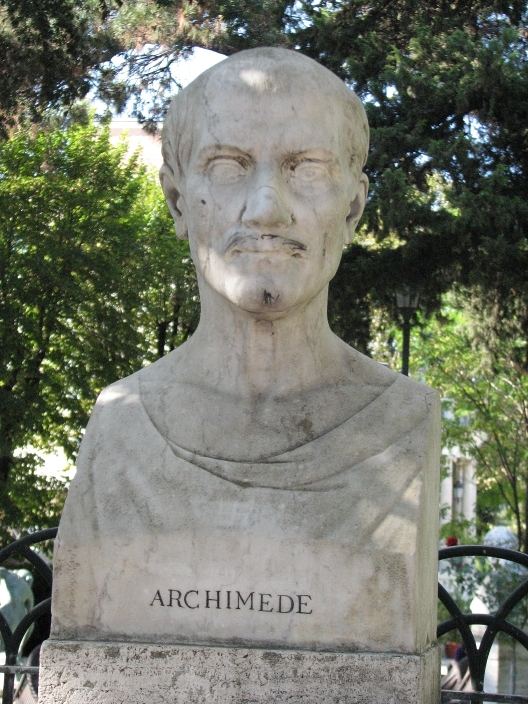 He is most commonly remembered for a theorem concerning the area of lattice polygons, polygons in the plane whose vertices occur at points with integer coordinates: the area of such a polygon is numerically equal to one less than the number of lattice points in its interior plus half the number of lattice points on its boundary. Pick published his theorem in 1899, but it received scant attention until it was commented upon by Steinhaus in his 1969 text Mathematical Snapshots. Part of the popularity of Pick’s Theorem is its elegance: it is simple to state, it is simple to discover (once told to expect a relationship involving area, lattice points in the interior, and lattice points on the boundary, initial explorations with rectangles suffice to generate linear relationships that suggest Pick’s result); and a formal proof [e.g., this one at Cut the Knot] is relatively straightforward. Jean-Robert Argand was born on July 18, 1768. He was a bookkeeper and amateur mathematician, and is remembered for having introduced a geometric interpretation of the complex numbers as points in the Cartesian plane (a discovery that had been anticipated by Caspar Wessel in a paper published in 1799). Argand’s treatment of the subject appeared in a self-published anonymous monograph in 1806, which found its way to Legendre and eventually Jacques Français, who published an article about the idea and some of its ramifications, and asked for help in identifying the originator of the idea. Argand came forward, and a debate ensued in print as to the validity of working with complex numbers as geometric quantities, not merely algebraic objects (Argand and Français arguing in favor of geometry, François-Joseph Servois arguing against). 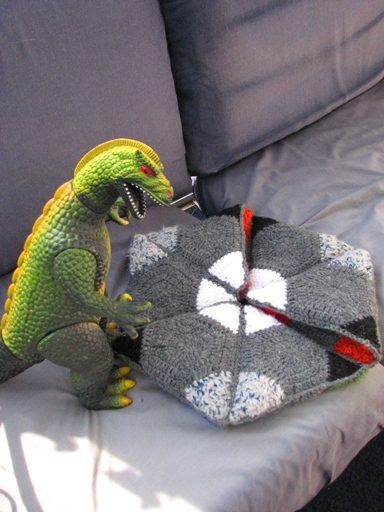 This exchange served to solidify the association between Argand’s name and the geometric representation, and henceforth the name has stuck. Curiously enough, Servois and Argand nearly share a birthday. June 29 is the birthday of two topologists: Eduard Cech [born in 1893] and Witold Hurewicz [born in 1904]. Curiously, in addition to sharing a birthday, they also share credit for the independent discovery of higher homotopy groups, a subject which Cech had spoken on at the 1932 ICM, and which Hurewicz developed independently in the mid 1930s. Jules Lissajous was born March 4, 1822. His doctoral studies were on vibrations of bars “using Chladni’s sand pattern method to determine nodal positions”. This method of viewing vibration patterns entails covering the object with flour or sand, and inducing vibrations, often by stroking with a violin bow (or in a modern lab using amplified sounds at variable frequencies). The vibrations cause the sand or flour to accumulate into a pattern, indicating nodes in the vibrations of the object, locations where the standing waves of the bar have least magnitude. 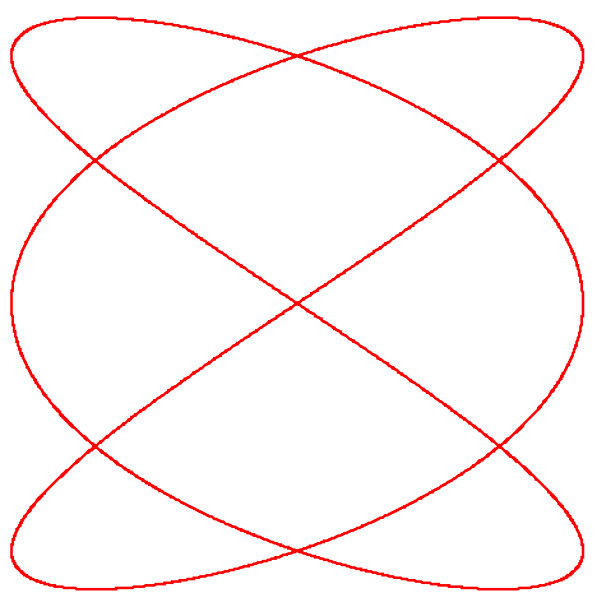 Lissajous died on June 24, 1880. 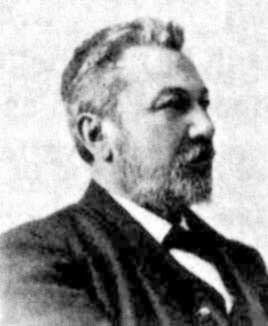 Julius Petersen [1839 – 1910] wrote on a wide variety of mathematical topics throughout his career. His dissertation concerned geometric constructability, but he also published work on differential equations, analysis, number theory, algebra, and even such applied topics as mathematical economics and cryptography. 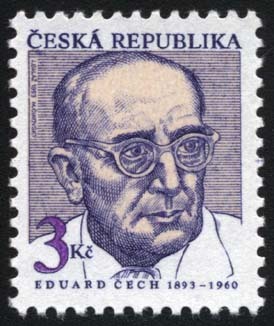 He is best remembered for his pioneering work in graph theory; his 1891 paper on the theory of regular graphs has been cited as the beginning of graph theory as a discipline. 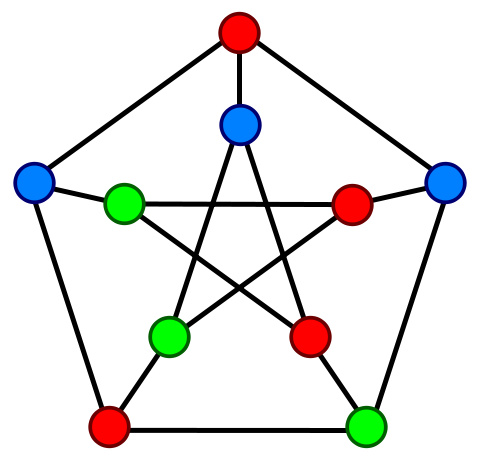 His 10 vertex graph, known simply as The Petersen Graph, is “the smallest bridgeless cubic graph with no three-edge-coloring“, and has become one of the standard (counter)examples studied in introductory graph theory courses. One wonders if John Tukey’s parents had considered the name “Julius”. Wantzel died at a fairly early age (just prior to his 34th birthday), reportedly a victim of overwork, lack of sleep, irregular eating habits, and abuse of coffee and opiates.